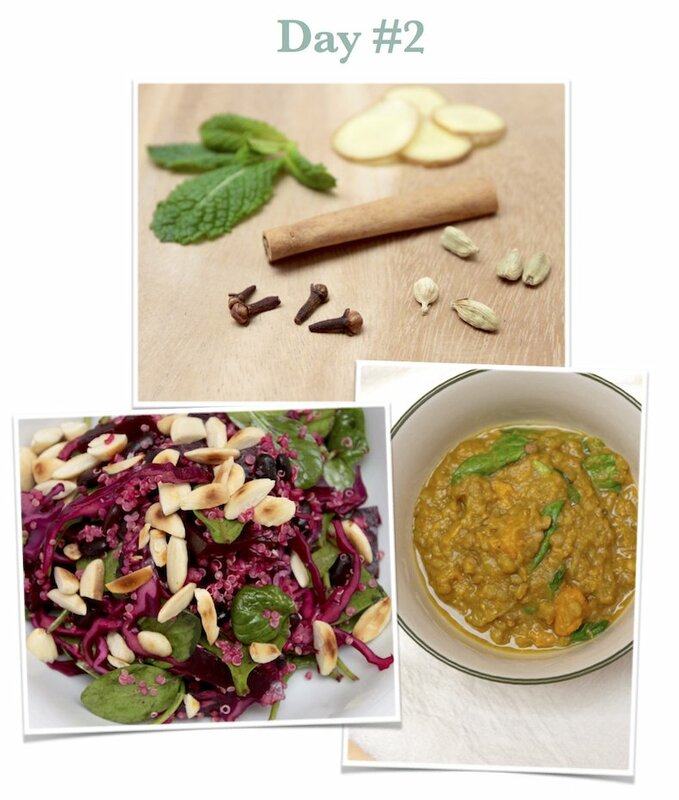 Here is today’s detox food diary! Bring everything to boil in a big pot and let it simmer for 5 minutes. You can save the tea for later and reheat when needed. Place a big pot over medium heat with a bit of oil or ghee. Then toss your onion and garlic into the pot and cook them for a few minutes. Add the rest of the veggies with the spices and stir everything together. Then add the lentils and water and bring to boil. Turn the heat down to low and let it simmer for 2 hours. Pour half of the stew into a blender and pulse until you get an even paste. Pour it back into the pot and if you find the stew to thick add a bit of water. Now stir in the spinach and let it rest for a few minutes before serving.